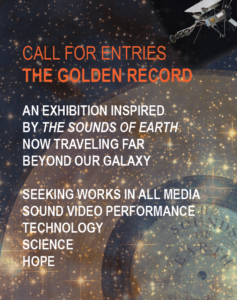 Seeking entries for The Golden Record, an exhibition inspired by the images and sounds of “The Sounds of Earth,” the recording that is now traveling on the Voyager spacecraft far beyond our galaxy, bearing hundreds of sounds, including the Brandenburg Concerto, whales, footsteps, greetings in 55 languages, thunder, crickets, brainwaves, a heartbeat, and “Dark Was the Night, Cold Was the Ground” by Blind Willie Johnson. Submit works in all media, including sound, video, performance, technology, and science that reflect on the beautiful and daft hopefulness of this compilation going forth for 40,000 years to be sort of near the closest star. Curated by Brooke Leeton, Rebecca Brantley, Jon Vogt, and Paula Runyon. Your entry fee of $10.00 goes to sustain the gallery, which is a 100% community-supported and 100% volunteer organization, providing a space for artists in Athens for over 16 years. ATHICA provides a limited number of fee waivers for those in financial need. To enter, complete this form and submit $10.00 to info@athica.org via Paypal . Be sure to include the name and email address used on the submission form in the notes on your PayPal payment (many people have different PayPal names than their real names) so that your payment can be properly registered. Only those entries with paid entry fees will be considered.